7. The results of the competition will be announced on 20 May 2019 8. The cartoons sent to the competition will not be returned. All cartoons, whether they have won a prize or not, may be used for cultural purposes and may be published. Participation assumes acceptance of these conditions. All cartoons will be kept in the ‘Turhan Selcuk Karikaturlu Ev’. 9. The cartoons selected by the jury will be displayed in the exhibition and will also be printed in the album. 10. 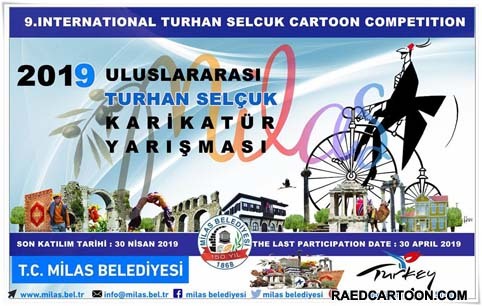 The reward ceremony will be held on 13 September 2019 The opening of the exhibition will be held on the same date, in ‘Turhan Selcuk Karikaturlu Ev’ for cartoons which have won an award or have been selected for display. The exhibition will be open until 1 October 2019. 11. Accommodation and meal expenses for participants who have won a ‘Special Award’ will be met. Travel expenses will be borne by the participants. ​ Travel, accommodation and meal expenses for competitors who come first, second and third will be met by Milas Municipality.